A flageolet is a type of flute. Maybe this guy just has a passion for the arts. AUTO V: [CB1, choose 1 face-down card in your G-Zone, and turn it face-up] When this unit attacks, you may pay the cost. If you do, for each face-up “Genesis Dragon, Flageolet Messiah” in your G-Zone, choose up to 2 locked cards, and unlock them. If you unlocked 1 or more cards with this effect, choose any number of locked cards, and those cards will not unlock during their player’s next end phase. If you unlocked 3 or more cards with this effect, this unit gets Critical +1 until end of battle. “Absolute Judgment” is finally on sale at the end of this upcoming weekend! 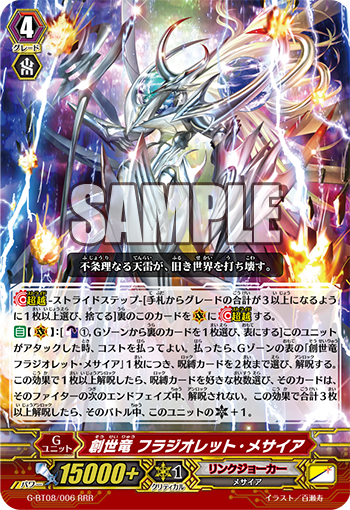 Today’s card we’re introducing is a 《Link Joker》 RRR Card, “Genesis Dragon, Flagolet Messiah”! When it attacks, you can pay the cost by Counter Blast and G Persona Blast, then first you get to Unlock a number of Locked cards equal to the number of face-up “Flagolet Messiah” times two! And if one or more cards are Unlocked, you can choose as many of the remaining Locked cards, then Omega Lock them. If you Unlock three or more, this card gains an additional Critical! So during your first Stride of this card, aim to Omega Lock, an ability that’s quite handy in a strategy based on sealing your opponent’s attack strategy. Because it has the cost of a G Persona Blast, it allows you to also easily use the Generation Break 2 of “Alter Ego Messiah”, allowing you to instantly defend during your next turn. During your 2nd Stride of this card, aim to attack with a Critical 2, so if your opponent’s worn out, you’ll potentially be able to take them down in an instant attack! Also you can Lock your Rearguards that attacked, and if you Unlock them, they will be in Stand, so be sure to prepare for an all out attack with your Vanguard and Rearguards! And even if you fail to seize the win with that attack, you’ll have your opponent on the ropes as they’re sure to be unable to recover from Omega Lock!